Welders, cutters, solders and brazers work in a variety of industries to weld together metal parts. According to the Bureau of Labor Statistics, there were 337,300 welders working in the U.S. in 2010, with 61% working in manufacturing and 11% working in the construction field. Rosenfeld Injury Lawyers LLC knows first hand of the dangers associated with welding as many of our clients have suffered welding-related accidents. We invite you to discuss your Illinois welding accident case with our firm without any cost or obligation on your part. Only if we are successful in the prosecution of your case will a legal fee be charged. Other tradesmen such as pipe fitters and ironworkers also use welding as part of their occupation so it is estimated that the amount of workers that use welding in their jobs is closer to 2 million. 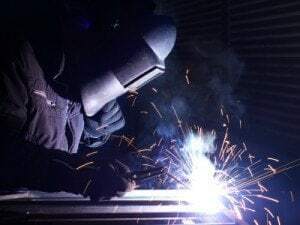 These workers have a high risk of injury from exposure to welding hazards (such as Welders Parkinson’) and thousands have serious eye injuries every year. If you or a family member was injured while working as a welder, you are likely entitled to workers compensation benefits. Contact the workers compensation attorneys at Rosenfeld Injury Lawyers LLC for more information and a free review of your legal rights and options. Eye Injuries. Due to the bright visible light and the exposure to ultraviolet radiation, welders are prone to eye injuries and damage. Exposure can cause damage to the eye surface, membrane and retina that can result in cataracts and even blindness. Skin injuries. The UV radiation emitted in some welding can burn the skin, either from direct exposure or reflected off of another surface. Just like all UV radiation, long-term exposure can cause skin cancer. Fume injuries. The fumes produced during welding are made up of solid particles that can be deposited in the lungs. The particles composition varies with the different types of metals used. These fumes over a long-term period can cause many health issues including: nervous system disorders, cancer, kidney damage, lung problems and bone and joint disorders. Protective eye gear. Welders need to wear helmets, shields or goggles for eye protection, the type dependent on the type of welding being performed. Protective clothing. OSHA requires that welders wear protective clothing to protect them from skin burns and radiation exposure. Ventilation. All confined spaces have a prerequisite to be properly ventilated for welding to protect the worker from harmful gases. If you have been injured in a workplace welding accident in Illinois, you may need legal representation to get the best possible financial compensation for your workplace injuries. Many welding injuries can cause permanent damage at it is important to look at the long-term costs of your injury. Our team of personal injury attorneys in Chicago are well versed in OSHA regulations and will strive to get the best compensation outcome in your case. We offer a free, no-obligation consultation to discuss your injury and never charge a fee unless we are able to get you a financial recovery.